The key active ingredients in Biotulin are botanical extracts, sourced from herbs acting similar to an anesthetic. As such Biotulin is safer than injections, which are paralyzing facial muscles by using potent neuro-toxins. Main focus while developing Biotulin Supreme Skin Gel was to obtain a safe product, which shows a ‘botulinum toxin-like’ effect without triggering allergies or adverse skin reactions. Therefore Biotulin is a clear gel, does not contain perfumes or scents and is parabene free. Naturally it is depending on the extent of areas you are targeting. If applied only on your face (forehead, frown lines, between eye-brows, around the eyes, “crows feet” ), then experience shows it will suffice for about 4 ~ 6 weeks. If you include additional skin areas (your décolleté or neck ) it will surely last not that long. Principally Biotulin is a water based gel and therefore can be easily incorporated in any daily skin care routine. After cleansing your skin, apply a pea-size drop on your fingers and gently massage it in. Generally it takes less than 60 minutes until you fully sense the tightening effect. Within short you will find out the characteristic response of your skin, how to maintain the effect and to adjust your individual dosage accordingly to get the best results. Over-dose or over-use is not really possible. The perfect application process however suggests, that you use Biotulin in the morning and evening, best on cleansed skin as the ingredients will penetrate better. Apply a pea-size drop on your fingers and massage it in, especially on forehead, frown lines, around the eyes. And different to injection procedures, Biotulin is not limited to the facial areas, but can also be applied to your neck and décolleté. A final benefit: if you have an important meeting or date you can easy apply an additional layer during the day to give you that extra lift … (just remember it takes up to 60 minutes for the tightening effect). Because Biotulin acts more like an anesthetic, its effect fades off after ~24 hours, so no risk of long-term negative side-effects as to what is reported with needle-injected treatments. The developers of Biotulin skin gel have consciously decided to formulate and pack the product in Europe (Germany), as here stringent safety standards are in place; not only for the quality of raw material and extracts used, but also for the professionalism of the manufacturing laboratory and integrity of an independent quality control. The sophisticated pump dispenser prevents germs from contaminating the content, as can happen with open jars. Due to this air tightness the Biotulin gel is not exposed to oxygen or accelerated product aging and therefore its key ingredients remain active for 6 month (after opening the dispenser). (Still it remains good practice to store any cosmetics in a cool place and out of direct sunlight). Biotulin can prevent you from creating strong expression lines, when you start early enough. If you are thinking about Botulinum Toxin injections, but don’t like any side effects (eg droopy eye ) or you are worried about being dependent on the skills of the practitioner and any resulting outcome, then Biotulin is also for you. Generally it is for you, when you had enough of Botulinum Toxin injections and you want to explore a more natural pathway. Same time it is an add-on product for everyone who wants the benefit of softer facial features and more radiant skin. How fast do I see results? Generally every skin is different and depending on the history and depth of your lines, you will experience varying results. People with thick, sun-damaged skin may not see the same results as someone with medium / thin skin. However, the anesthetic effect of Biotulin ( different to Botulinum Toxin injections ) can be felt and seen very quickly. The herbal extracts work on the muscle action, while Hyaluronic acid is acting as a water binding ingredient. It will plump up the skin and makes it radiant. What about other “Botulinumtoxin-in-a-bottle” products? Most of so-called ‘in-a-bottle’ products are based on ‘peptides’ as active ingredients, mainly on the synthetic peptide ‘Argireline’. Only high concentrations show results. Often these formulas are combined with other critical ingredients, which might increase the risk of allergies. 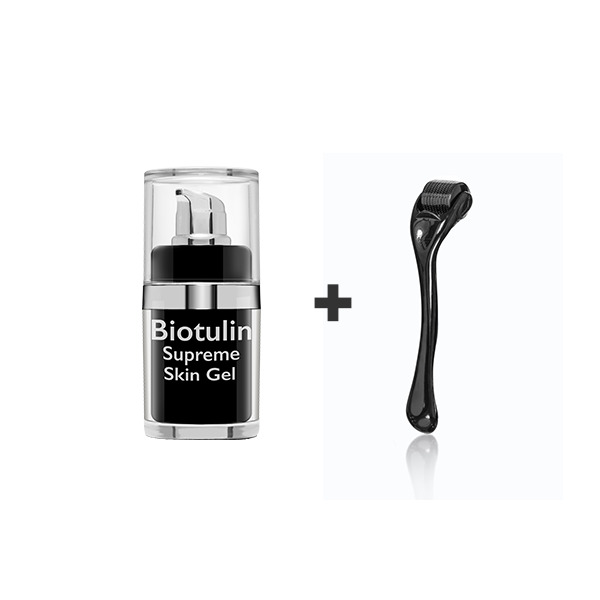 In summary: The key benefits of Biotulin Supreme Skin Gel? It is a natural and safe alternative with proven ingredients and not a prescription drug. It is suitable for every skin, and allergic reactions therefore are very unlikely ( to check with full INCI ingredients list click here ). It has a known anesthetic effect on your muscles, and is not not a neuro-toxin paralyzing your facial expressions and avoiding related negative side-effects. No side effects observed so far. It can be applied not only on the typical ‘injection-zones’, but on all areas of your face (forehead, between brows, around the eyes/crow’s feet, lips,), but also on the neck and décolleté, if desired.